I know what a CTD is, I just had trouble remembering what the acronym stands for. Apparently it’s “Conductivity, Temperature, and Depth” as Kerstin explains it to me. Kerstin is one of my ArcTrain colleagues. Matter of fact she had participated in CTD sampling the day before and now she was asking me to help out. Two of the girls in the group from the night before were busy with some other high tech scientific research equipment. They were throwing a bucket overboard and sampling ice water. Now when someone asks you on board of a research vessel sailing beyond Internet cover if you want to help out, the immediate mental image is of a shipwrecked crew fighting for survival with polar bears and saber tooth seals roaming around. One needs allies in such a scenario so obviously, I accepted. The CTD cast was scheduled for 7:00am the next morning. In order to be in top shape the responsible researcher goes to sleep early enough so as to wake up in time for this. I tried to do that and went to bed at 11:00pm. Then we hit the ice. Now, one of the main differences between the Titanic and Polarstern is that when she meets sea ice, Polarstern is happy. So happy in fact that she starts to shake and purr like a cat as she glides over an ice flow or another. Adorable as it may seem, for the young Arctic researcher unaccustomed to the ways of ships and ice flows it comes as the best possible alarm clock when the vibration of your bed makes you bite your own tongue at 3am in the morning. Once aware of the fact that the ship is just gliding over the ice and you are not actually in any mortal danger, the moving bed becomes actually comforting. Like a hammock in the breeze, with some added squeaks. I am perfectly happy to get back to sleep after such an event, the problem occurs when I have to get back to sleep 4-5 times a night because my inner ear doesn’t learn and keeps alerting me that my apartment block is collapsing without realizing that I’m not in my apartment block anymore and that everything is fine. In the end I wake up relatively rested at 6:30am. Time to get the equipment on for working on the outside deck. This has to be done in reasonably quiet conditions because your two cabin mates are sleeping after a night shift that ended 2h before. Being a scientist and not a ninja has its downsides when sneaking in the darkness and I soon entangle myself as I try to wear the work pants as a jacket. At 7:05am I go through the kitchen where the stewards have just finished preparing the tables for breakfast and the smell of fresh bread greets my empty stomach as I read the station schedule displayed in the common room. Because of the high concentration of ice in our path we were late to the waypoint. The station is postponed for 10:00am. Back we go to quietly stumble into our dark cabin in order to catch another hour of sleep just before breakfast ends. 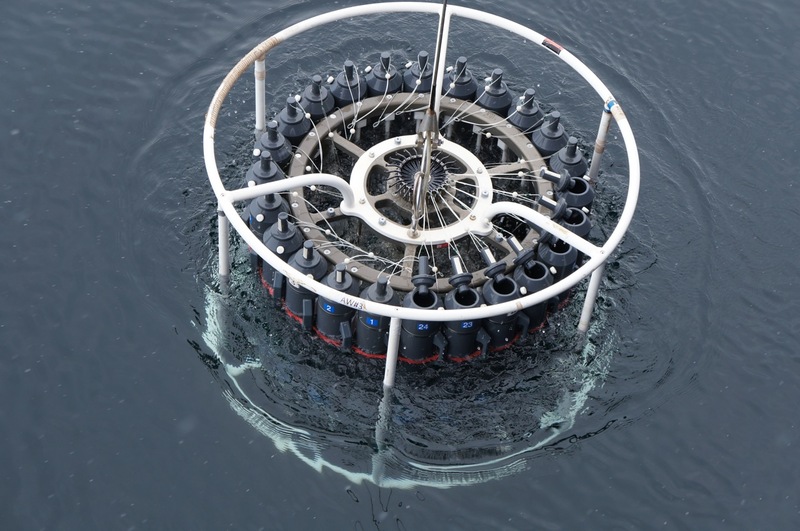 The CTD rosette is a beautiful contraption, if you like symmetry. 24 cylinders are arrayed on the outside of a round rack while a clever locking mechanism connects them all to 24 pegs in the center. 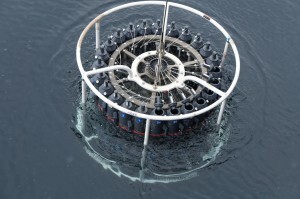 Those pegs should trigger the cylinders to close at certain depths in the ocean in order to trap inside water from that depth. Maybe it’s obvious to you but for me it was a revelation that ocean water is not just salty water. If you look at the walls of a canyon you will see layers of different color and thickness, each layer telling a different story about its age and composition. The ocean is not like that. Not completely. You wouldn’t find out much by cutting it in sections, so just sampling water bottles from different depths has to suffice. On the inside of the rack there is a clever looking cube of metal and plastic that is the actual CTD device and it continuously measures (you will never guess this !!!) the conductivity, temperature and water depth as the rack sinks into the ocean. Now because most of the clever work went into building this device and will go into analyzing the data it collects, the job I was asked to do was that of a middleman that has to transfer water from the 24 cylinders to little bottles of different shapes and sizes for scientists to look at in the lab, later. One obvious fact that I hadn’t thought about before and nobody thought to mention to me is that sea water stings when it gets in the eyes. 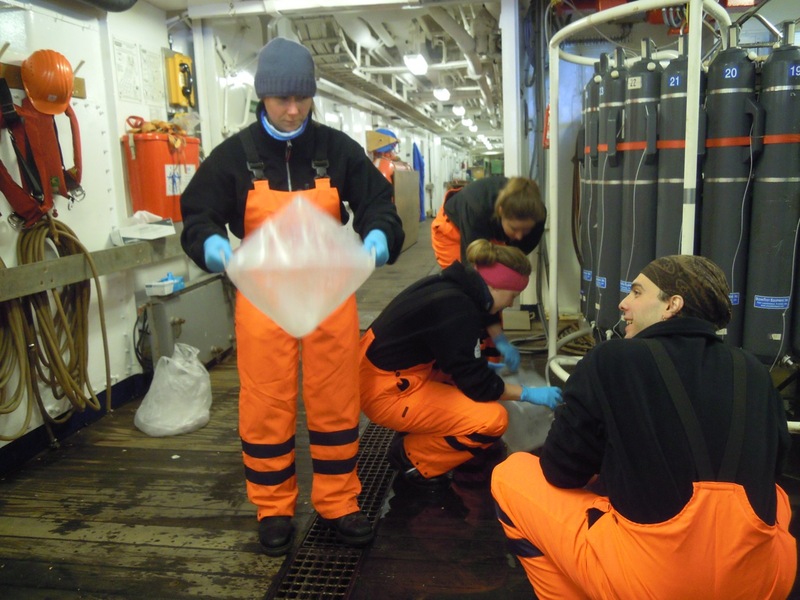 I usually swim in water bodies with enough chlorine to kill the fragile little organisms we were interested in analyzing so that sea water is something of a novelty to me. As I hunch down next to each cylinder in turn, I have to connect a tube and let water flow inside a little bottle. The tricky part is to not leave any air bubbles inside the bottle to prevent a chemical exchange between old deep water and modern air. The smell alone might be lethal to some organisms. Half the trick in accomplishing this is to keep the tube inside the water in the bottle in order not to form bubbles as the bottle is filled. The other half of the trick is to pinch it shut at the key moment before the bottle fills up and water shoots out straight towards the eye that was watching for when the above mentioned key moment is reached. I don’t have good reflexes so that after one and a half hours of filling little bottles with sea water I had red eyes and cold fingers. 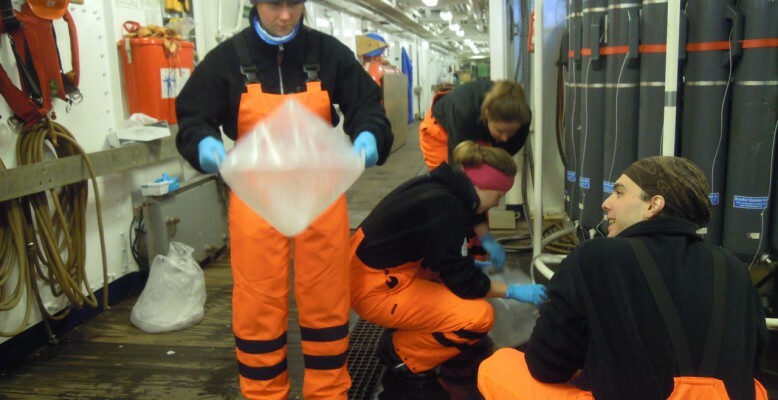 We are given gloves to wear while taking these samples, but not in order to protect ourselves, but the precious little samples themselves from contamination. Even though mom taught you to always wash your hands because of germs, she never mentioned all the metals and other chemicals that are sticking to your hands. When all the samples are collected, Kerstin asks me how I found the work. She was also collecting water samples from the opposite side of the rack. We had spent the last hour gravitating around the CTD rack tapping into the cylinders like crazed orange bees. I preferred to pretend that I was remembering a very sad movie instead of admitting that I had squirted salty water in my eyes for the last hour or so when she asked about my red eyes. I complained about the cold fingers while raising my blue hands (the plastic gloves are blue, my hands weren’t THAT cold). At this she smiles apologetically and takes of her own gloves. She had a second pair of textile gloves underneath to help with the cold. The temperature of water from the Arctic Ocean was a second thing I hadn’t considered before going along with this job.